Parenting has a way of changing your priorities, and that restructuring can put a lot of stress on your relationship with your spouse. 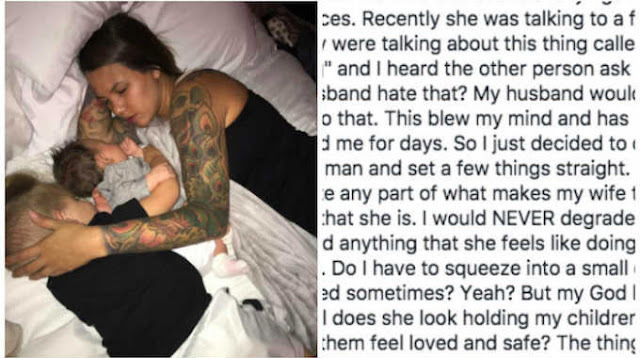 One man took to Facebook to reassure his wife – and send a message to men everywhere – that it’s okay to put motherhood first. When David Brinkley – no, not that one – is used to hearing his wife, Alora, have long phone conversations with her friends. But when he overheard one in which her friend questioned his wife’s co-sleeping, he decided to step in. Alora’s friend couldn’t believe that David was okay with sharing their bed with their two kids. He heard the friend ask, “Doesn’t your husband hate that? My husband would never let me do that.” He went to Facebook to set the record straight, and wrote a touching tribute to his wife – and mothers everywhere – in the process. In the post, which has been shared over 258,000 times, it’s obvious how much David appreciates his wife and admires her as a mother. He stresses that all men should respect that aspect of their wives’ identities. Despite his focus on his wife, these same reasons apply to many fathers as well. David’s post articulates exactly why it’s so hard to deny our kids when they climb into our beds, and why maybe we shouldn’t freak out about it. It doesn’t take long for our kids to grow up, and those instances when they want to snuggle quickly grow fewer and farther between. Parenting requires a lot of sacrifices for both men and women, and sometimes that includes more than just giving up bed space. Sometimes it means allowing your role as a parent to supersede your role as a spouse. It helps if you appreciate and respect that aspect of your relationship as much as David clearly does. With that kind of perspective, losing a little bit of bed space isn’t such a big deal. This post was republished from newzmagazine.com. You can find the original post here.